Product #31290 | SKU SEL2470Z | 0.0 (no ratings yet) Thanks for your rating! Walk around all day with the Vario-Tessar T * FAE 24-70mm f/4 ZA OSS Lens from Sony , a compact full-frame option that covers wide-angle to short telephoto perspectives for working with a variety of different shooting styles and subjects. A constant f/4 aperture makes operation smooth and consistent throughout the zoom range. The lens further benefits from the use of one extra-low dispersion element and five aspherical elements to combat aberrations as well as a Zeiss T* anti-reflective coating to keep flare and ghosting to an absolute minimum. 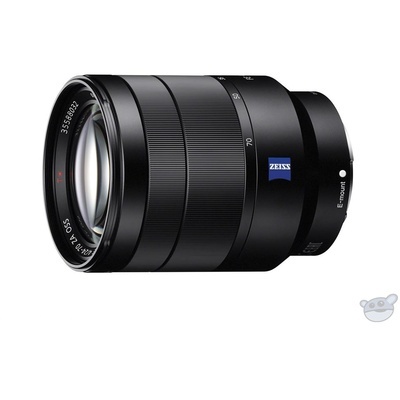 The lens is fast to focus as well due to the linear autofocus motor and an internal focus design. Additionally, the dust- and moisture-resistant lens is equipped with Optical SteadyShot image stabilisation to reduce the effects of camera shake, and it has a seven-blade circular diaphragm for smooth bokeh. One extra-low dispersion glass element is featured in the lens design to help reduce chromatic aberrations and colour fringing for improved clarity and colour neutrality. Optical SteadyShot image stabilisation helps to minimise the appearance of camera shake for sharper imagery when shooting handheld with slower shutter speeds. This stabilisation system can also be combined with select camera's sensor-shift type image stabilisation for more effective control of camera blur. Dust- and moisture-sealed design better permits working in inclement conditions and rubberised control rings benefit handling in colder temperatures.